← Bonfire of the smartphones – Cathy Davidson vs. Baroness Greenfield? 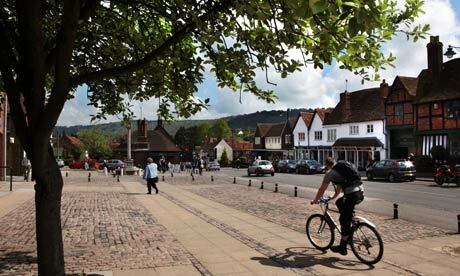 I was living back in the UK from Jan-June 2011, in the picturesque village of Wendover, Bucks. I have been going there for 17 years, since that is where my wife’s family lived for 50 years. On arrival, I discovered this normally rather conservative (and Conservative Party voting) community was up in arms with their own government’s proposals. The issue was the proposed High Speed Rail line that the government wants to build from London to Birmingham (they inherited the project from Labour in 2010). Although the project is being sold to the British people as a fast alternative to existing transport modes, it does nothing for the communities along the route, looked to be very destructive of an AONB (area of outstanding natural beauty) in the Chilterns as well as urban locations, and does not seem to be the sort of project that a virtually bankrupt country should be undertaking at this stage. I also discovered that to save money, the route would pass right by the west side of Wendover without a tunnel, with trains thundering along every few minutes at 250mph. I wondered if the local protest was of the ‘not in my backyard’ NIMBY variety. But I concluded the route had not been thought through, nor the huge cost, the disruption, and the economic justification looked pretty weak. Turns out HS2 is really all about relieving capacity on the West Coast mainline passenger trains to Birmingham/Manchester/Scotland, which are pretty full it must be said, but surely there are other ways to do this? Sounded like we were trying to emulate Europe and China, who have some success with High Speed Trains? Here is my response to the public consultation, which ended in July, very lightly edited. There is not going to be a Public Inquiry on this – the government no longer offers many of those, which means it can push through large proposals more quickly and with less public consultation. But there is, and will be, massive protest I am sure, from all sorts of people, rural and urban residents, and political orientations. In January 2012, after I wrote all this, the construction of phase 1 between London and Birmingham was approved in Parliament with an indicated opening date of 2026. However by mid 2012 doubts have been raised about how, and when, the project will get off the ground as Britain struggles with other priorities. The Wendover area has been promised a deeper cutting to conceal train noise, and I visited the town again in June 2012 and found people fairly resigned to the project. Also an embarrassing report on HS1 in Kent has shown it to be struggling financially. In July 2013, next visit to the UK, the costs of the project have ballooned even before ground has broken, and one commentator thinks it is merely a government foil to say that they are investing in Britain’s economy without actually tackling mass unemployment in de-industrialised towns where there is little hope of a job. Peter Mandelson from the Labour Party also thinks the project is too expensive, having previously supported it. Compensation for thousands of blighted properties near the route is clearly inadequate. This an ideological battle and a locational one that will never die until it is replaced by another urgent infrastructure debate. Disclaimer I am British but do not own property in the UK. I have been visiting Wendover for 17 years, living there Jan-June 2011. I had daily discussions about the project, attended an HS2 roadshow, and read most of the hundreds of pages of official HS2 reports and analyses. No, there is not a strong case. The economic case for the line has been overstated using speculative economic modelling, with insufficient attention to non-economic factors. Estimates of job generation from transport are by the consultants’ admission, difficult to model and only estimates exist. But we know that HS2 will funnel more jobs into London, rather than spreading them more widely. This is basic spatial economics combined with gravity modelling. Nobody involved in the debate seriously believes a reverse flow of jobs to the Midlands, Scotland and the North of England will occur anytime soon after construction. However the main issue is spending £34billion to Scotland (plus likely overruns) on a megaproject during a major recession when public services are being cut back. To allocate much of this sum to provide more train capacity and a quicker journey to and from Birmingham, really stretches credibility. Since there will be no commuter stops along the line, it is of no economic or social benefit to 90 percent of the people along its route. There is a real risk of poorer services by the franchises running the existing lines since they will lose long distance business (85% of HS2 passengers are predicted to come from existing lines) and there will be echo effects on other lines. “HS2 came behind the electrification and modernisation of existing rail lines (at the expense of High Speed), improving our national roads network and, in the case of transportation professionals, was even ranked as being less important than both an integrated freight network and the proliferation of light rail.” (June 2011). Moving more freight on the railways….there’s a thought! No mention in the HS2 documents. This is not encouraging. Leisure, tourism and long distance communing trips would of course be easier, but tickets are likely to be costly, as HS1 has shown, depending on franchise arrangements. No. I echo the views of some campaigners here – although I am not a member of their group. The question asks for views on the whole route between London, Manchester and Leeds without providing detailed information on the whole route! I need to see other route options to Scotland to answer this question at all. What other options have been considered? Many people do not need to be sitting at their office desk in London or Birmingham to conduct part of their business. I am one of these people. Business travellers do work when sitting on our existing trains, often for one or two hours. You have not factored this in to your analysis. In other words, you have ignored teleworking, web based activity, and mobile communications. Too much value is placed on small time-savings on each individual journey, which have been converted into ‘cash benefits’ to enhance the business case. There are cheaper alternatives which would address our needs in the future, for example longer trains on the West Coast Main Line, and some minor infrastructure enhancements. John Whitelegg has analysed these in detail. It seems unlikely that we will see huge additional demand for rail travel, unless flying in the UK is banned or becomes uneconomic, or road use is rendered unfeasible for some reason. 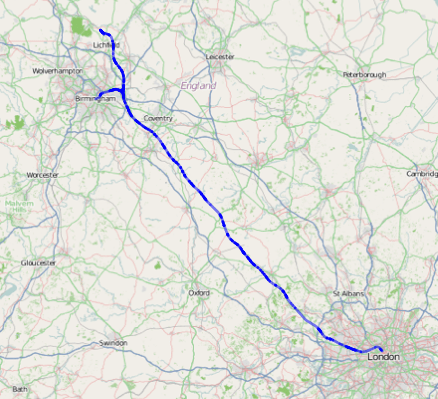 The point that flying would be avoided by building HS2 seems erroneous on the London to Birmingham stretch, since hardly anybody makes that journey by plane, but has some validity from Scotland to London. Other planned developments which will improve capacity over the coming years are not discussed e.g. Chiltern Railways Main Line project south of where I used to live. We already have a good high speed rail service between London and Birmingham. Links between the rest of the UK and London are already good, with cross London routes in place and another under construction. How the links to Heathrow will be made, linking to a very fast train, are unclear to me. Access to Heathrow has already been significantly enhanced in the last decade. Further options should be explored before any money is committed to a high speed network. On the Planning process used: the project is not subject to a full Planning Inquiry as other mega-projects like Heathrow T5 have been. The only chance to comment on the proposal is through a limited written ‘public consultation’, with no other promises of public input. This is not a best practice approach. The public still want to know and comment on alternatives to the whole scheme. Although denying this the government seems to have its mind made up already by limiting us to the chosen route and scheme. On the supporting case so far: The principles adopted by HS2 Ltd were flawed. There has been an overwhelming emphasis on speed and time saving in the documents. The decision to design the line for 250mph trains means that the line of route has to be pretty straight, and there is no opportunity for it to bend and avoid sensitive environmental features and settlements including AONBs, SSSIs, endangered species habitat and monuments. We are not in competition with China to have the fastest trains. I am told you do not yet have signalling technology for 250mph trains. What is the timeline and cost of that? A new design should be commissioned for trains running at HS1 speeds – ie up to 186mph. There is no need to go faster. This should enable the line to follow an existing transport corridor. Slow it down and show us what could be delivered with a speed saving. Any new rail line should follow existing major transport routes e.g. the M1 or M40 corridors. The A413 is too minor . HS2 is really a motorway to London, without the lorries, with fewer exits. So – No. The ‘preferred’ route through the Chilterns affects an Area of Outstanding Natural Beauty and, the Metropolitan Green Belt, and a range of other sites. Even if extensive underground tunnelling takes place, which is currently only programmed for the affluent sections to the immediate west of London, there will still be new cuttings, noise, loss of ancient woodland, and closure of tracks and lanes (over 100). There are churches only 200m from the proposed route, and crucially, a colony of endangered Bechstein bats in north Buckinghamshire. Clearly, avoiding Areas of Outstanding Natural Beauty, green belt, high-quality farm land, footpaths, ancient monuments and listed buildings was not given enough weight in the decision-making process. I would like to see the tunnel proposal for Wendover reinstated. If a decision is taken to proceed with the scheme, a tunnel right through the Chilterns AONB should be offered to mitigate the noise and visual impacts. HS2 has failed to provide detailed noise impact data. Noise demonstrations organised by HS2 in their recent Roadshows were unconvincing and thousands of homes will experience serious noise, some without compensation because they are just under a threshold. There has been no real attempt to show how noise impacts will be addressed. Yes. I have read it in detail. There is no Environmental Impact Assessment or Strategic Environmental Assessment available for public consultation, only this briefer ‘Appraisal of Sustainability’ that is sketchy on cultural preservation and focuses on economic ‘regeneration’ benefits. The lack of a full independent assessment for a project of this scale, prior to a decision to build or not to build, is telling. No psychological or cost-benefit assessments have been made of different routes and scenarios (at least these have not been released to us-there are rumours some have been conducted). No regard appears to have been taken for the landscape that the proposal will impact. I was taught landscape impact techniques when at University two decades ago – nothing has been used, not even geo-visualisation of alternative routes. The information on jobs “created” is sketchy. It does not clearly identify them as transfers from elsewhere in the country (or indeed from other construction projects and rail operators). Construction site compounds and construction traffic would blight the countryside for years. Property blight will, in my estimation and those of local estate agents in Buckinghamshire ( I talked with 4) , run into decades. There is no information as to how noise, dust and vibrations would be controlled during the construction process. Carbon emissions: normal high speed trains produce 35% more emissions than equivalent car journeys, and HS2 even more – 50% more than Eurostar. The project, as presently conceived, might just be carbon neutral but constructing the line will incur huge carbon emissions that are not sufficiently budgeted, unless you have redone the figures recently. Estimates of flight and car use reductions that it would generate are optimistic, to say the least. The Transport Studies Unit at Oxford have pointed out that total journey time, and energy use (factoring in getting to and from the stations in the first place), is more important to survey than the much-touted ’travel time reduction’, which is the main selling point for HS2. Heavy car use is anticipated to reach the very few stations. As Christian Wolmar says” To oppose HS2 is not to be anti-rail”. We need more north-south train seats, for sure. But the ‘capacity increases’ from HS2 will only benefit those close enough to the stations, or able to access them easily (probably by car). Noise: High noise levels will be inflicted on residents both during construction and operation of the line. We need to see detailed noise maps, better than the ones handed out at the HS2 roadshows. How will noise targets be policed and operators controlled if they exceed them? Biodiversity and the ecosystem: It will cut through 23km of high grade farmland. There will be huge visual impacts, especially with viaducts over flood plains. Up to 2 million cubic metres of waste would arise from tunnel and cutting excavation, some passing through aquifers and chalk river systems still not fully understood, like the Misbourne. The proposal also impacts national paths (e.g. The Ridgeway) and closes 79 rights of way in Bucks. It is unclear who has already benefited from compensation and how much has been given. Property blight is already significant in Wendover, having talked to agents over the last 6 months. The market is stagnant. Detailed noise corridors are not fully researched, and thus the level of support that may be given in the unlikely event that the project proceeds, is still unclear. Many other communities along the route are already suffering in the same way. There is no apparent compensation for the construction process, which will be extremely unpleasant. The political case: While the project is endorsed by Labour (who announced it in March 2010), it is quite odd that it has become a cornerstone of Coalition policy. But hundreds of thousands along the route and further afield now oppose it strongly, including those that vote Conservative. Politically it would be wise to consider their views, outside of a formal consultation. This is standard impact assessment practice. In addition the Major of London, Boris Johnson, and the Greens are opposed to the current plan, as are the astute transport gurus Christian Wolmar and John Whitelegg.